Italian niche line il Profumo has launched Romeo, a new fragrance for men. 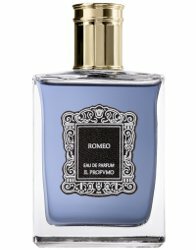 Romeo follows the brand's two prior Shakespeare-inspired fragrances, Othello and Lysander. Romeo, eternal love rounds out our Shakespearean trilogy. A romance where love is the absolute master of the senses. Romeo is a modern and asserted composition thanks to the woody and leathery notes of tobacco balanced by the crispy ardour of the galbanum. A timeless sensuality. Il Profumo Romeo is available in 50 and 100 ml Eau de Parfum.